It seems that lately I've only got bits and pieces done. A little of this, and a little of that. I can't seem to get any consistency, especially in blogging. I think it is because I am still trying to find my way back into a routine following my surgery. I am still trying to push myself to do thing,s to find out what the consequences are. I need to find my new limits before I can establish a routine that works. I want to do as much as I can while I am able, so that means stretching myself further than I've done for a while, which results in pain and fatigue, which means less energy for blogging. It is a good thing though because it means I am doing more, even it means less knitting. I did start work on a hat for this Winter. It is the Cambden Cap by Woolly Wormhead. I bought the yarn ages ago, Malabrigo Rios, and it really is lovely stuff, like all Malabrigo. 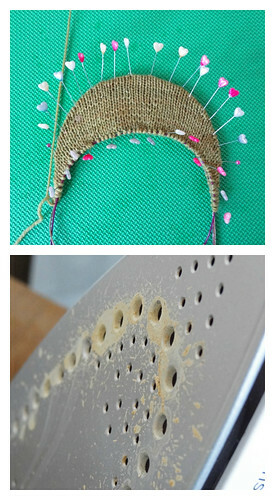 It is the yarn suggested by the pattern and bought it especially. 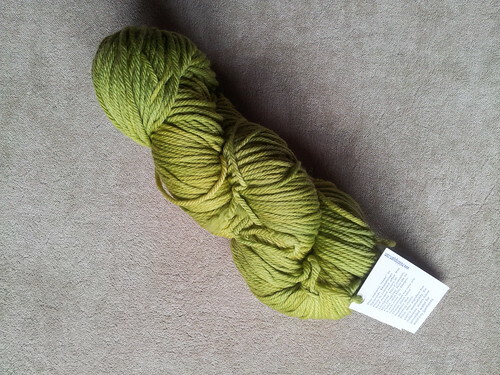 It is very rare for me to do that, as I usually want to save money, but as this was only one skein I decided to splurge. I found the Rios at Tangled Yarn. They have such lovely and decadent yarns there, I always want to buy more than I should, whenever I go to the website. The yarn is superwash, which means it won't felt if it gets rained on, which is kind of important in a hat, in the UK! The pattern is from Woolly Wormhead's latest book, Classic Woolly Toppers. I like that you get the option of getting the PDF with the purchase of the book. This is the option I went for, because I like looking through a physical book, but I prefer to work from a PDF, so I don't feel bad about marking it up with notes. This pattern is the main reason I bought the book. I really, really wanted to knit this pattern. It has a peak, which is something I really value in a hat, especially in Winter, when we have a low sun that shines in your eyes. It also keeps rain off my glasses. I started work on the peak last week and got as far as blocking that part out. I managed to gunk up my iron in the process. I don't normally steam block, but this seemed the best and quickest way to get on with the hat. I forgot that I have a setting to clean out the limescale on my iron and managed to use that setting while steaming. Looks great doesn't it? It all cleaned off, so don't worry, and I didn't drip any gunk on the hat! Once I had a peak I set about making a template to cut out of plastic to insert in the peak pocket. The way I blocked this peak was all wrong. I should have checked the shape suggested in the pattern for the template, and blocked in that shape. The shape suggested was much more elongated, less curved. I think it relaxed into the right shape after blocking though, so it has worked out. My process stopped at this point as I couldn't find any template plastic in the house. I'm sure I have a packet somewhere, I just can't find it. I use it for patchwork, which isn't often, but I thought I would have remembered using my last sheet up. Never mind, I've ordered a couple of sheets and they came today. I can now pick up where I left off, and get my lovely new hat finished! The pattern suggests using an old plastic drink bottle, but I wanted to make sure the peak was stiff enough to keep the rain off my glasses. I think I was right to wait, but it was hard putting the project to one side, when the yarn is so lovely to work with. I hope to get on with it later today. I wonder if I could get it finished by Friday - probably not, I have other bits and pieces I need to crack on with. I'll tell you about them another time! 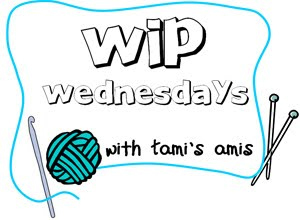 For the first time in ages, I'm hooking up with WIP Wednesday, over on Tami's Amis. Click on the button to see what other people are up to!